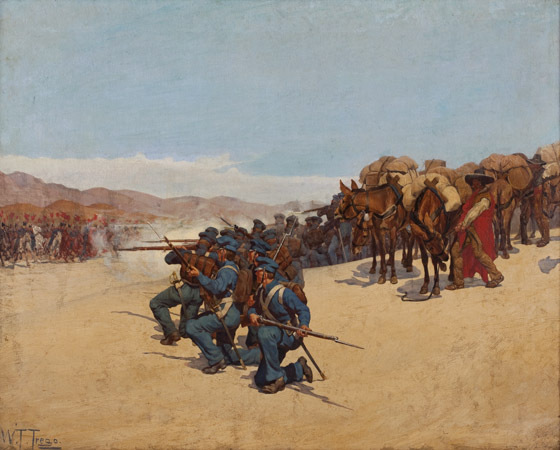 The painting is one of seven commissioned by publisher George Barrie of Philadelphia as illustrations for his monumental work The Army and Navy of the United States, published in Philadelphia, 1889–95. The painting was reproduced in section 8 as a 9½- by-13¾-inch photogravure, hand colored in the original deluxe editions. Trego’s signature in the lower left corner of the canvas did not reproduce well and thus he was not credited with the work in Barrie’s book. Unlike the other prints, the reproductions of this scene were not always well served by the hand coloring they received. Throughout the Mexican War (1846-48) supply trains of the United States Army were under constant threat of lightning attacks by the crack cavalry units of Mexican General Santa Anna. Here Trego shows the response of one of the American infantry units to such an assault. Sold at Auction, Sotheby Parke Bernet, 1979. (Fine Americana, Sale Number 4211 [New York: Sotheby Parke Bernet, Inc., 1979]) to the father of the current owner.